I've never thoroughly analyzed how many one-year wonders there are but I'd bet you a dollar that 1961 would have the most. 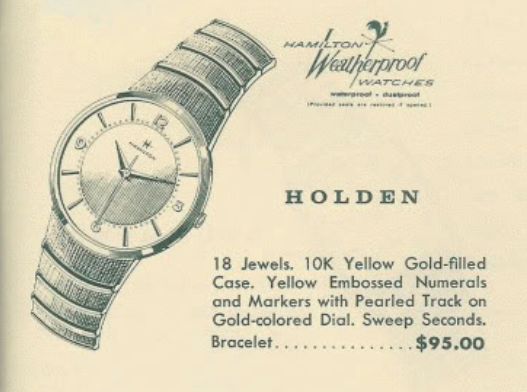 It seems like 1961 was a crossroad year and Hamilton pulled out all the stops. There were Thin-o-matic, Electrics, Automatics, Accumatics and all sorts of manual winders too. One of the 1961 models that didn't make it to 1962 was the Automatic K-420. The K-420 is a unique watch and came with it's own specially designed bracelet that matches the case perfectly. If it looks familiar, you might be thinking of the Holden, which was also a 1961 one-year wonder. 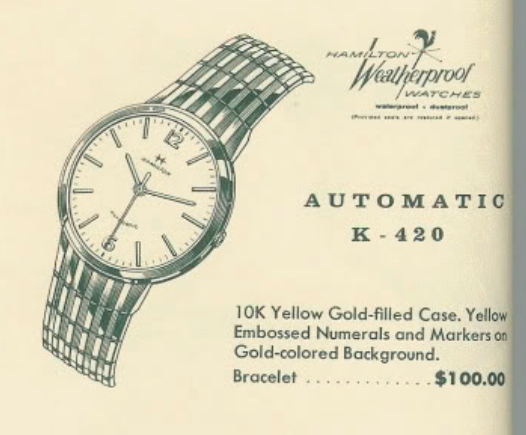 The catalog doesn't do the watch justice, in my opinion, because the K-420 has a golden dial too. So on the wrist I am sure the K-420 had a lot of bling to it. By 1961 the Automatic K-series was using the 17 jewel 667 movement, which replaced the 661 grade used previously. The two movements are very similar. I think the main difference is the shape if the rotor, or oscillating weight, which allows the movement to fit into a more tapered case. I recently received a K-420 from a friend and fellow collector. I saw the watch on eBay and was going to make a run at it but it got too rich for my blood and it was VERY rough looking. As received, it didn't look any better in person. Is it just the crystal that's dirty? No, as you'll see in a minute, this entire watch was a complete disaster. I have no idea how a fine iwatch can get this dirty. It would be interesting to hear it's story. Looking closely at the case back, there are no visible seams so this is a one-piece case and will open through the crystal. Uh oh... it has a Wittnauer crown. Now I know I'm in trouble. Actually, Wittnauers are fine vintage watches too and as good as any other Swiss company of the time. The crystal was in terrible shape and extremely dirty but the dial isn't much better. Holy smokes! This is a new record setter as far as dirty watches go. It's a cornucopia of corrosion... you have rust, verdigris, and a few other oxides based on what looks to be sand inside. Did I say the watch was also not running? It's no wonder, after looking at the movement. Even the inside of the case back has corrosion - you don't see that very often. I think it's just crud from the rotor. With the dial removed, the main plate looks just as dirty as the back, but it's not rusty and that's good to see. With the rotor and carrier out of the way you can see the dirt and grime goes all the way to the center. Wow... the movement is clear of parts now but it's going to take a couple of passes through the cleaning solution to make sure all this grime is removed. I made the mistake of putting all the small parts in with the really dirty big parts and the cleaning solution was so cloudy after the first pass that I couldn't even see the smallest parts in the jar. I had to use a flashlight shining up from under the jar to see the tiniest parts.. but I found them all. Now everything is bright and shiny (well, maybe not the rotor - it has lost some plating). The movement is now running with good motion. The timer agrees with my visual observation. Everything looks good at this point. The rotor lost some plating when the rust was removed but it doesn't look too bad. Plus you'll never see it when it's inside the case. I gave the dial a "poor man's refinish" after cleaning it the best I could. Fortunately I didn't lose too much printing... in fact, the word AUTOMATIC looks the worst but it's no different than when I started. A new crystal makes the watch look much better too. However, I need to get an EvrTite crystal with a yellow reflector ring to finish the watch properly. I also replaced the crown too... the Wittnauer crown disintegrated in the ultrasonic as it was far too worn. It's not a bad looking watch now... I bet my friend will be happy he bought it. You never see K-420s. As they say on Antiques Roadshow, "try and find another".